“I’m so busy! I don’t have time!” These are the excuses I use for my less than stellar eating habits. But we all know what excuses are; and as my Mother would say, “You make time for what’s important to you.” And she’s correct. With this in mind, about a month ago I committed to three healthy lifestyle/diet changes. Drink more water. The benefits are endless; and I’ve done a good job with my daily intake. What I found is that I prefer my water room temperature, and consequently, I drink more. Stop skipping breakfast. It’s been said that breakfast is the most important meal of the day, but I never made the time. So, I incorporated a daily bowl of oatmeal and brown sugar into my schedule. Oatmeal is a quick fix, tastes good and helps lower bad cholesterol. Eat more fruits and vegetables. Now, this was going to be my challenge. I’m not the type to eat fruit and veggies all day. I’m allergic to peaches and don’t like bananas; and that’s putting it delicately. What to do? Last week, while scanning my favorite daily blogs and websites, I came across a recipe for a Greensicle Smoothie; and there was my answer. I’d try drinking my fruits and vegetables in a once or twice daily smoothie. In my excitement, I headed out and purchased a new blender ~ yes, I really did need a new one ~ and all of the ingredients for my Greensicle Smoothie. This morning was my first attempt at making the smoothie. Again, I don’t like bananas, but decided to try the recipe and see if the taste was overwheliming. 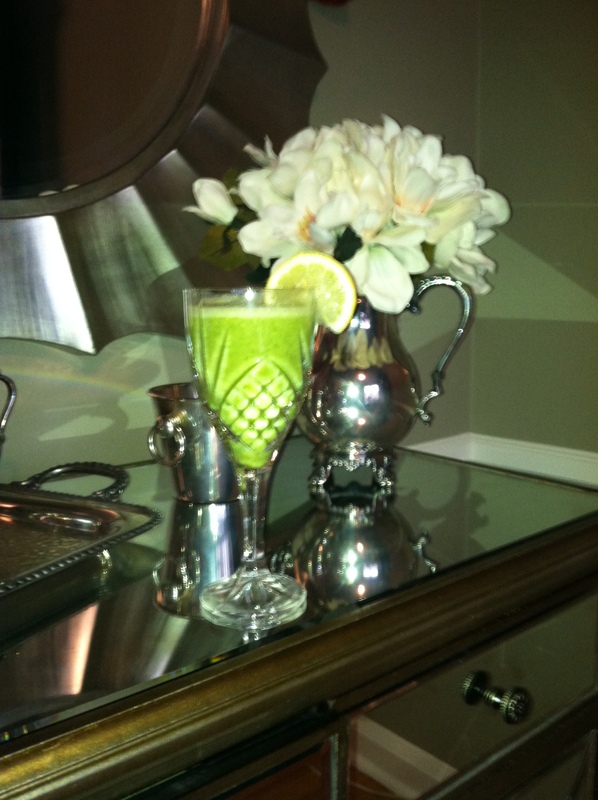 I even poured my Greensicle in to one of my prettiest crystal goblets, as if it would somehow mask the banana taste. What I learned ~ nothing beats a failure but a try. While the smoothie tasted pretty good overall and I finished the entire glass, still too much banana taste for me. Again, what to do? I called my “go~to” Doll on all things health and fitness, my cousin Susan, to find out what I can substitute for a banana. She suggested Greek Yogurt. Once again, I headed to my local Whole Foods store for my substitute ingredients. I even consulted with “Eric” the Whole Foods employee, who according to the young lady passing out avocado and black bean salad tastings, “knows everything about juicing and smoothies.” Eric agreed with Susan, and Greek Yogurt it is. I’ll check back in tomorrow to let you know how I feel about the new recipe.